The Address book window is accessed from the Address book item on the main menu or tray menu icon. 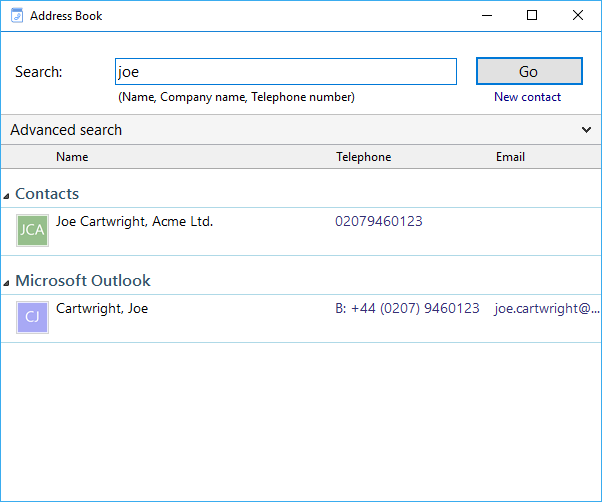 It provides access to a local address book included with the client. Enter the text to search for within the contacts. Click on this button to begin the search. Click this button to add a new contact record to the local Address Book. Click this button to show advanced options for further filtering of the search results. If you get too many results back, you may want to consider further restricting your search by using the Advanced options. Users can filter by address fields such as town or postal code (Where), other fields (What) and the specific database where you think the contact might be currently stored (Source). Click on the telephone number of a contact to dial them.